Namibia is a country located on the west coast of Southern Africa. 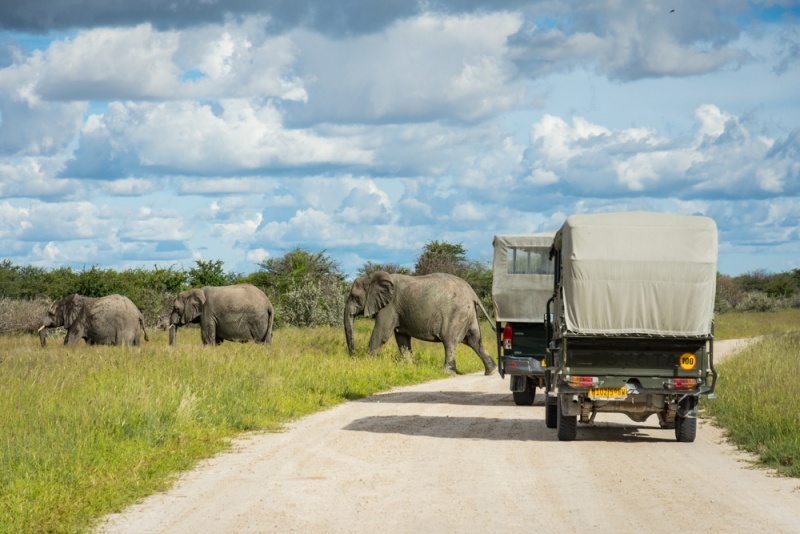 It has gained popularity with tourists over the years due to the fact that it is much safer than it’s neighbor to the south, and offers plenty of opportunity to view wildlife from the comfort of your own car. The country has also positioned itself very well to be an ideal place to road trip around in a 4×4 vehicle and camp near the major tourist destinations. Most of the roads are well maintained and many of the popular sites are very easily accessible. Visitors can choose to stay in luxury villas or sleep in a tent on the roof of their rental car depending on their budget and preference. But figuring out how to prepare, which sites to see, and where to stay can be daunting. 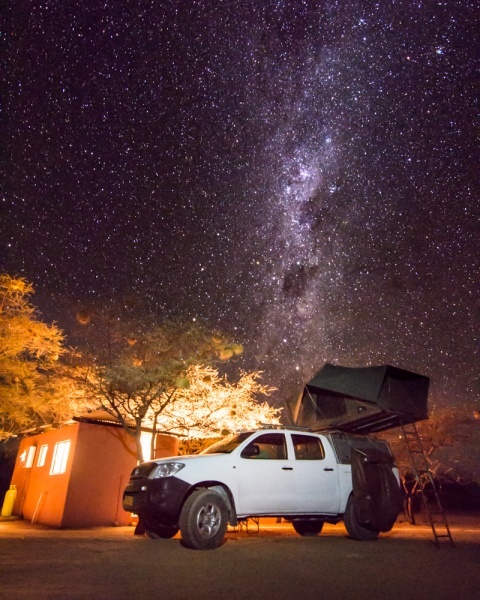 Follow our road trip itinerary to make sure you make the most of your time in Namibia! Namibia accepts two kinds of currency: the Namibian Dollar (NAD) and the South African Rand (ZAR). ATMs dispense both currencies and while in Namibia they are completely interchangeable. However both do not hold the same value in South Africa so be sure to convert your currency from NAD prior to leaving the country. At the time of writing (March of 2018) the exchange rate was 11.79 NAD to $1 USD. English is the official language of Namibia but there are more than 11 languages that are indigenous to the country and more than 49% of the population speak Oshiwambo. It is very common for Namibians to speak two or three languages. 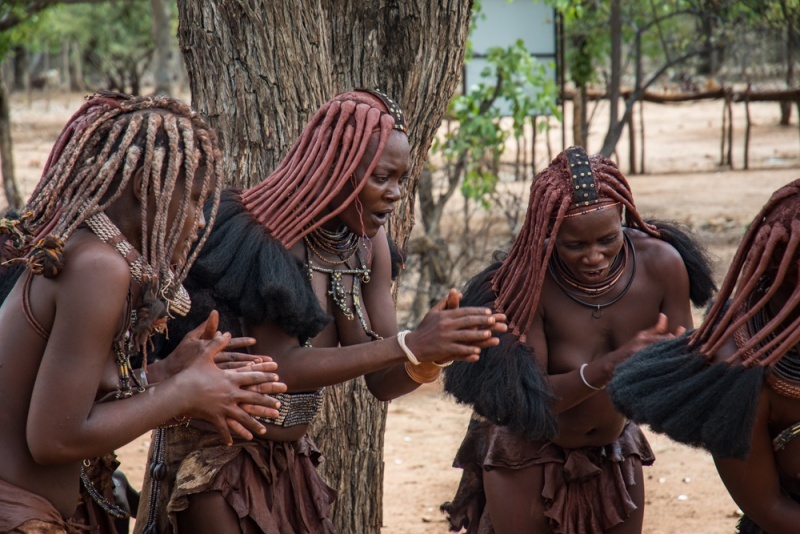 Every Namibian working in tourism speaks English but most of the Himba tribal people do not. Buy a sim card through MTC, they have the broadest coverage in Namibia. You can purchase a sim card for less than $2 USD and 1 GB of data will run you about $3 USD. Tips are customary and expected in Namibia. Of course you’ll need to tip your wait staff at restaurants and the staff at hotels and lodges. But beyond that expect to give a little something to “car guards”, the people who bag your groceries, and gas station attendants. For the most part tap water is drinkable in all major cities and in most of the campsites. The only campsite we encountered that did not have drinkable tap water was Epupa Falls on the Angola border. The climate in Namibia is pleasant year-round and the country can be visited pretty much any time of the year. The dry season is May to October and it is the best time of year for spotting wildlife as the animals will gather around the waterholes. However, July to October is high season so you will need to book your car and accommodations well in advance. April and May experience very moderate temperatures with little or no rainfall and October to February can be very hot. The wet season is between December and March although Namibia receives far less rain than it’s neighbors. Animals will be more scattered throughout the parks during the wet season which lowers your chances of spotting them easily. 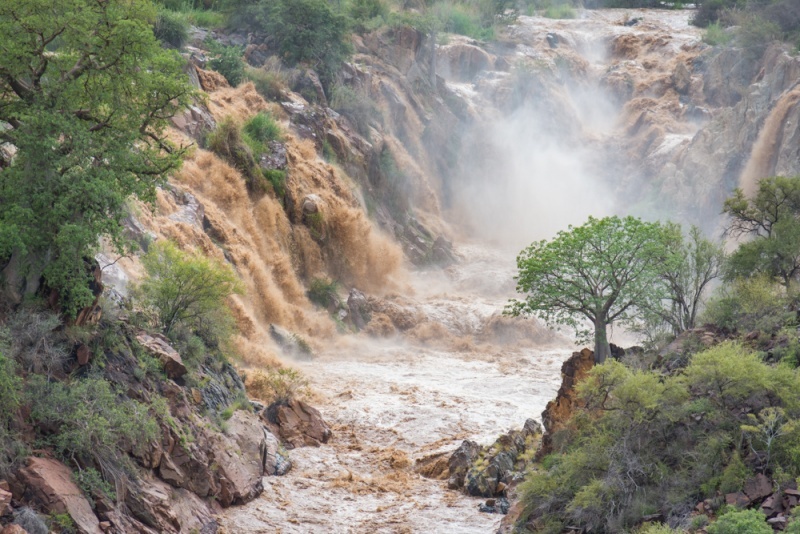 That being said, Namibia is a country that has an average annual rainfall of only 14 inches so you won’t be in danger of any monsoons and the light rainfall will mean a much greener and more scenic landscape. 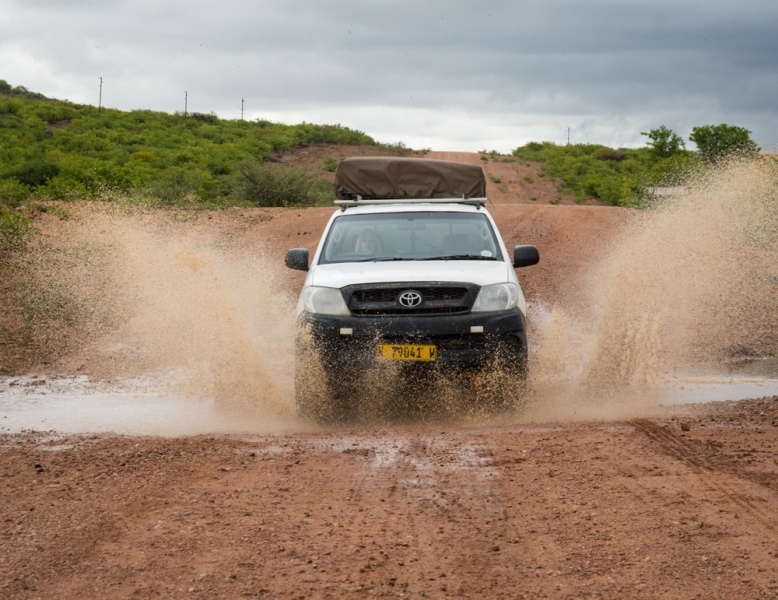 Keep in mind that driving during the wet season can be challenging as you will likely encounter a few river crossings and some mud. You’re in luck! We wrote a whole post about what to pack for a trip to Namibia. This road trip itinerary took us 21 days to complete but we also spent several days lounging by the pool. If you have less time consider skipping Fish River Canyon in the far south and/or Epupa Falls in the far north. If you have more time you should consider spending some time in Botswana or in the north east corner of Namibia. Bwabwata National Park, sandwiched between the Okavango River to the west and the Kwando River to the east, offers prime game viewing opportunities with far fewer tourist than Etosha. Namibia is an incredibly safe country although the increase in tourism over the years has also brought an increase in car theft. Rental car smash and grabs can be common in cities when tourists leave valuables in plain sight. Many young entrepreneurs wait in busy parking lots with an offer to watch your car for a small tip which is worth paying for added security. We were also advised not to walk around the cities at night – even for just a few blocks. Many of the people in Namibia are very poor and opportunistic crime happens occasionally. In general just keep your wits about you and make sure you trust your instincts. The World Health Organization and Centers for Disease Control recommend getting these standard travel vaccines prior to visiting Namibia; Hepatitis A and B, Typhoid, and Yellow Fever. The risk of contracting malaria in Namibia is low year round but it is higher from November to June in the following regions; Ohangwena, Omaheke, Omusati, Oshana, Oshikoto and Otjozondjupa. The side effects of the pills that protect against malaria are often worse than the disease itself and are generally not recommended. There have been outbreaks of foot-and-mouth disease in the Northern regions of Namibia so you’ll likely be asked to toss your meat and eggs when departing the area. Read all about driving and renting a car in Namibia here. The Windhoek airport is about a 45 minute drive outside of the city. Be sure to arrange transport with your rental car agency ahead of time otherwise you’ll have a pricey taxi ride. 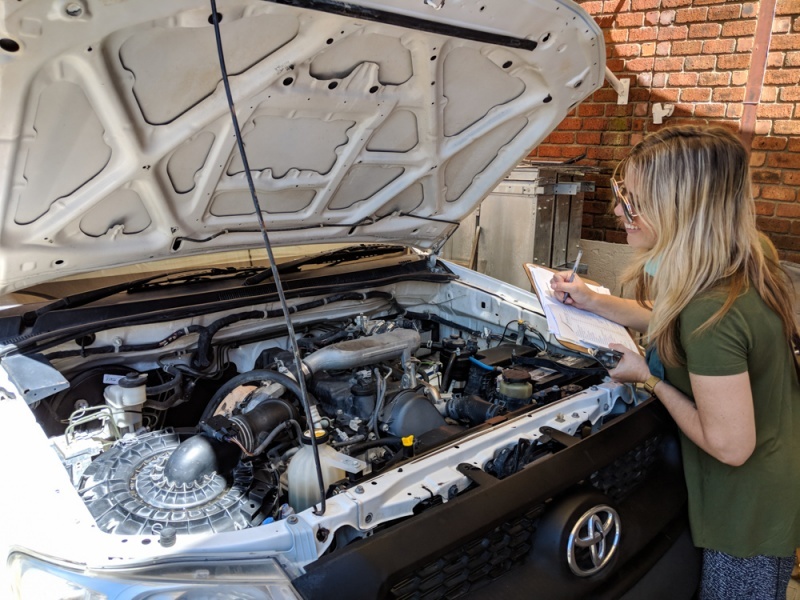 Then plan on spending at least two hours checking the rental car and the camping equipment to ensure that everything is in proper working condition. There are many rental car agencies to choose from in Windhoek. We went with Advanced Car Hire and found them to be very thorough, friendly, and our truck was in good condition and very reliable. Once you have your rental car in your possession you’ll want to fill up on gas and then head to the supermarket for food and any additional supplies. Depending on your flight time, it may be late in the day by the time you’re ready to hit the open road. However visitors are not advised to drive at night due to animals crossing the highways so you’ll want to plan on camping nearby to limit your drive time. Camping Amenities: Campsites offer pretty views of the lake and bathrooms have plenty of hot water. Activities in the Area: The short nature drive in the park costs 50 NAD/person and is a great place to spot zebra and other wildlife from your car. 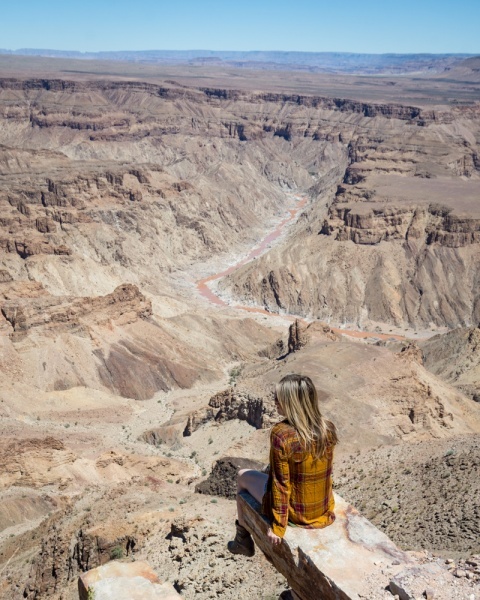 Fish River Canyon is the largest canyon in all of Africa with a ravine that is about 100 miles long. Unpaved, bumpy roads extend along the rim and offer plenty of opportunities to stare into the depth of this natural wonder. The drive from Lake Oanob is a long one so get an early start and plan on being in the car for about 6 hours. Along the way you’ll pass a few small towns and miles of beautiful expansive desert landscape. 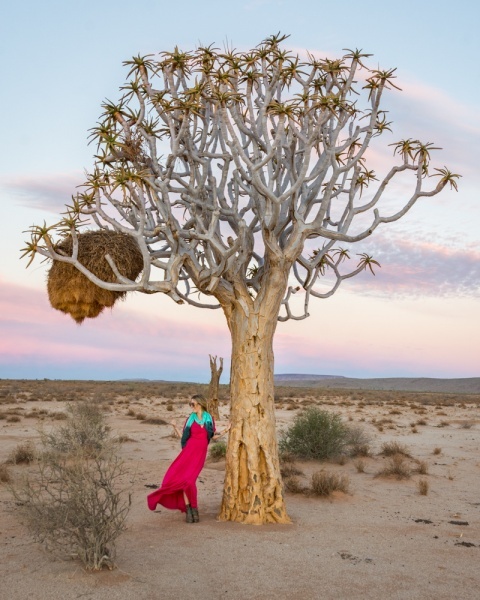 Make sure you stop for a look at the Quiver trees with giant birds nests clinging to the branches. Just to the east of the town of Keetmanshoop you can visit a Quiver Tree forest but you’ll pass plenty along your drive to Fish River Canyon if you want to avoid the entrance fee. 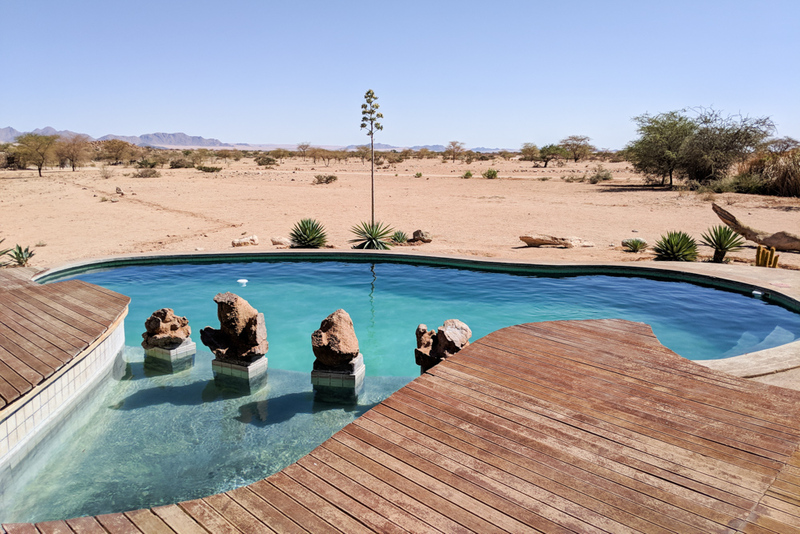 Make sure you top off your gas tank in Keetmanshoop as you’ll be entering a pretty remote part of Southern Namibia and you don’t want to have to worry about your gas gauge while you’re exploring! 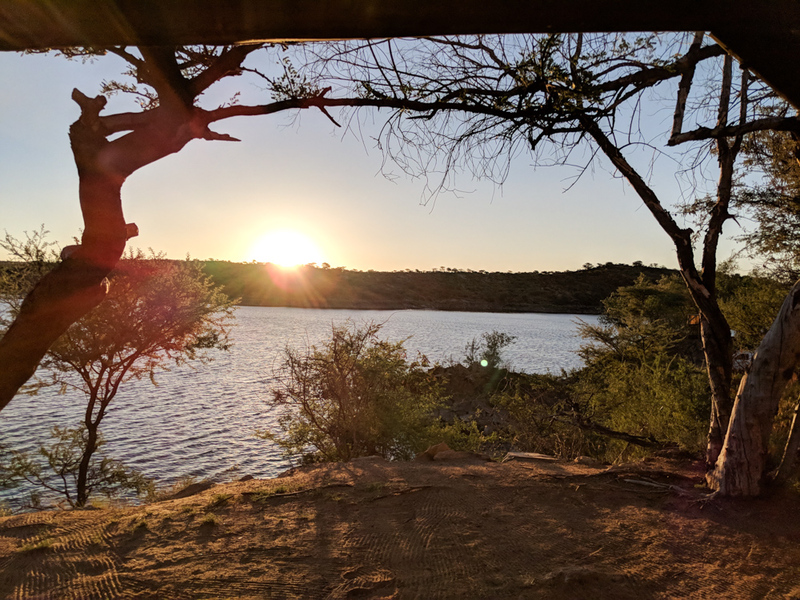 Hobas Campsite is the closest you can camp to Fish River Canyon and will allow you to enjoy an epic sunset over the stunning landscape. Camping Amenities: Plenty of shade for tent camping and very nice, well-maintained bathrooms. However hot water runs out early. Activities in the Area: Drive along the canyon and stop at the numerous lookouts along the way. From the Hobas Campsite it’s just a little over an hour drive to the peaceful and relaxing Ai Ais Spa. While there isn’t a lot to explore in the area, it’s the perfect place to spend an afternoon lounging by the warm pool that is fed by hot spring water after days spent in the car. Make sure you watch out for pesky baboons as they will steal your meat right off of your braai (that’s Namibian for BBQ). Park your truck in the corner campsite for the most shade throughout the day and then spend your afternoon sipping ice cold beers and relaxing in the pool. Camping Amenities: Bathrooms with hot water and showers, shady campsites, and a camp store selling beer and wine. Activities in the Area: Your camping fee gains you access to the large pool that is fed by hot spring water. While it’s not exactly refreshing on a hot day, it’s open 24 hours so you can relax in the warm water once the sun sets. 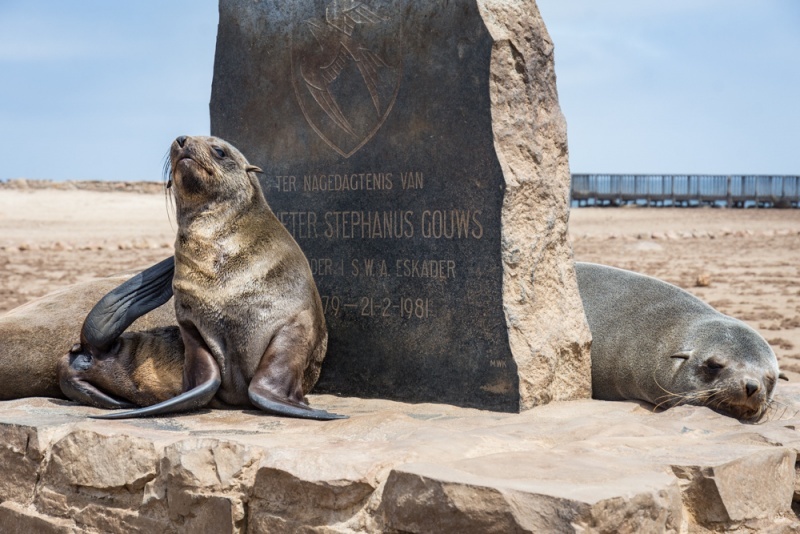 Luderitz is a harbor town that was founded in 1883 when some of the surrounding land was purchased on behalf of the German explorer Adolf Lüderitz. The town began to flourish in 1909 when diamonds were discovered nearby. Today the town is known for it’s colonial architecture and for the large population of seals, penguins, flamingos, and ostriches that call it home. On your way there you’ll pass through the tiny town of Aus and across an expansive desert that is home to Africa’s only herd of wild horses. They have managed to adapt to the arid climate of the region. Be sure to drive out to Diaz Point to see the old lighthouse and watch the sunset over the Atlantic Ocean. If you happen to be in town for breakfast or lunch don’t miss the Garden Cafe. 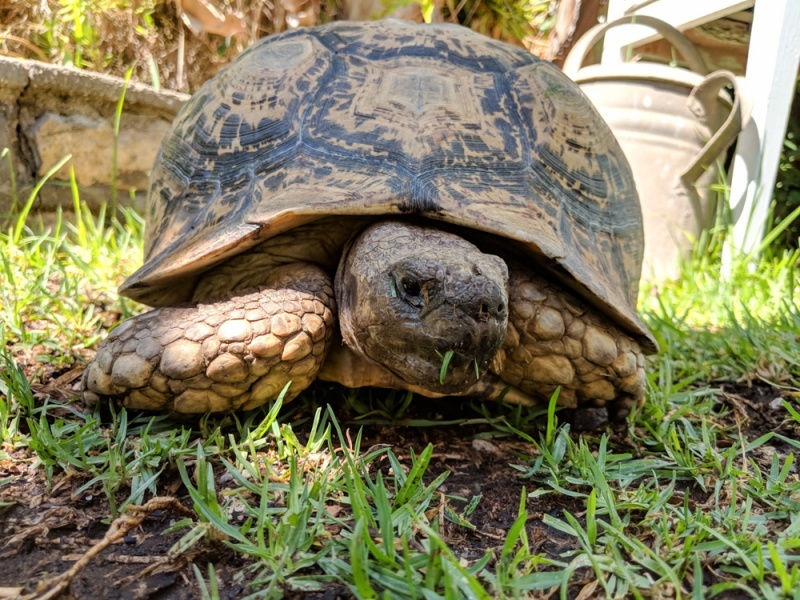 It’s a lovely shaded oasis in the middle of the town and even has a very curious free-roaming tortoise. Camping Amenities: This campsite is rather bleak. There are no picnic tables or water at the sites and the bathrooms have seen better days. 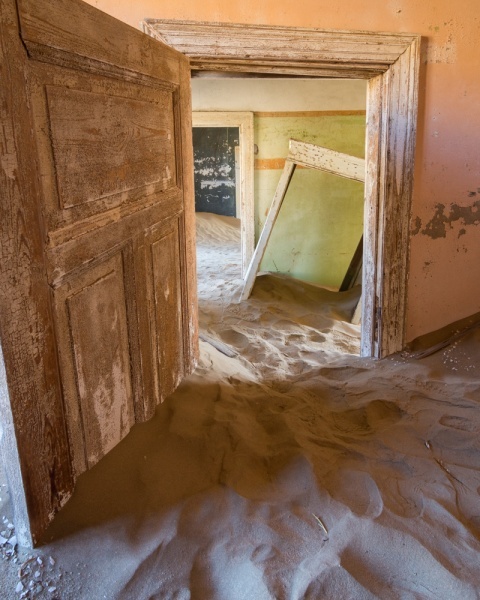 But being that it is just a 20-minute drive to Kolmanskop makes it all worth while. Kolmanskop is an old diamond mining town that was once so thriving that it had the first x-ray machine in all of Africa! Of course it was used to make sure employees weren’t trying to steal diamonds but is impressive nonetheless. 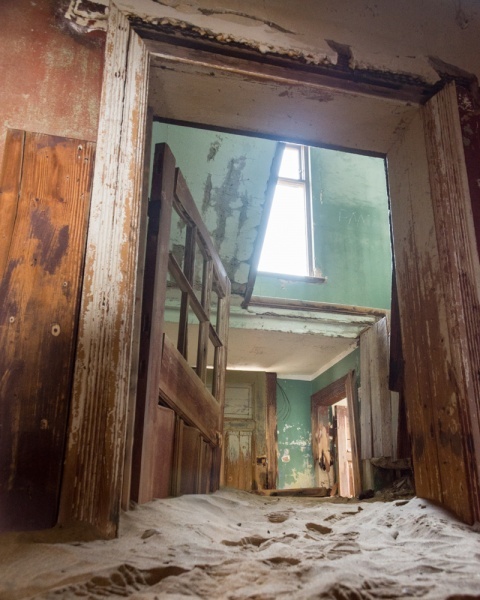 Guided tours of Kolmanskop are offered twice daily in both German and English. Beginning at 9:30am and 11:00am they take about 45 minutes and give a very comprehensive history of the town. The site is open to all visitors from 8:00am – 1:00pm to walk around and explore without a guide. The fee to enter the area during regular hours is 85 NAD/person. Amateur photographers can arrange to visit the site at sunrise or sunset for 235 NAD/person. The best light for photography is at sunrise but there is often fog in this coastal area of Namibia. If you would like to visit during sunrise you’ll need to arrange a photography permit the day before. This is best done in Luderitz at Luderitz Safari & Tours (phone: +264 63 202 719, hours: 9am-6pm Monday – Friday). 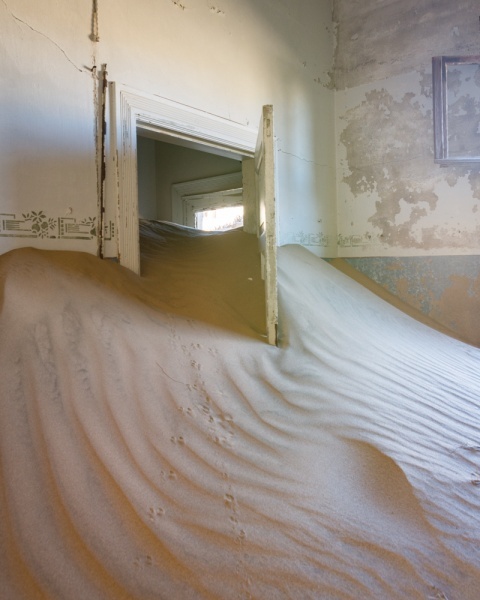 Kolmanskop is pretty remote so getting to your next location will take some time. Take a break midway through to visit the Duwisib Castle and learn about its intriguing history. The castle was constructed by Jayta Humphreys, an American woman and her German husband, ‘Baron’ Captain Hans Heinrich von Wolf. Construction commenced in 1908 but by 1916, the Baron had joined the German army that was fighting in the First World War and he was killed just 2 weeks after signing up. His wife never again returned to the castle that they shared for only a few years. 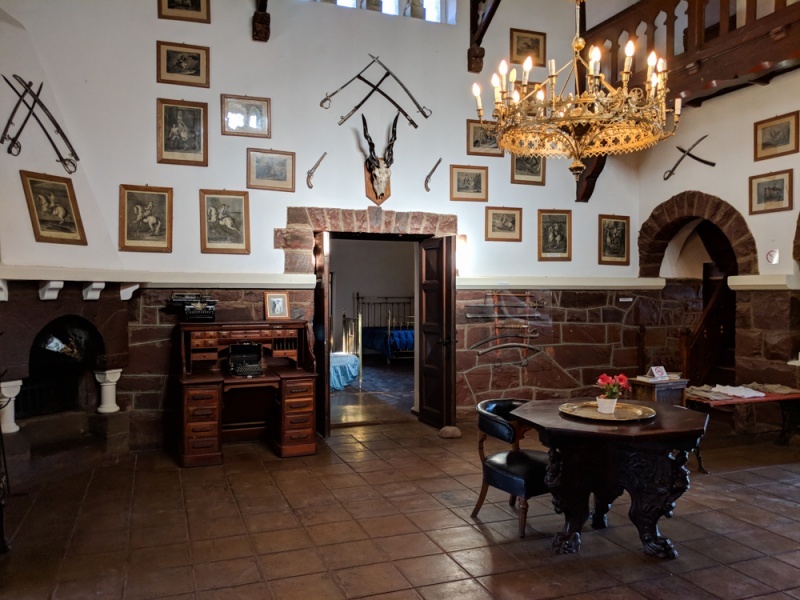 The property is now managed by Namibia Wildlife Resorts (NWR) and visitors can tour the castle for a small fee or even stay in one of the refurbished bedrooms. You’ll also find a lovely campsite right next door and it is only a 4-hour drive from Kolmanskop! Camping Amenities: You’ll pay an additional 20 NAD if you want access to wifi. Each campsite has it’s own faucet but no electricity. Bathrooms are small but very clean. 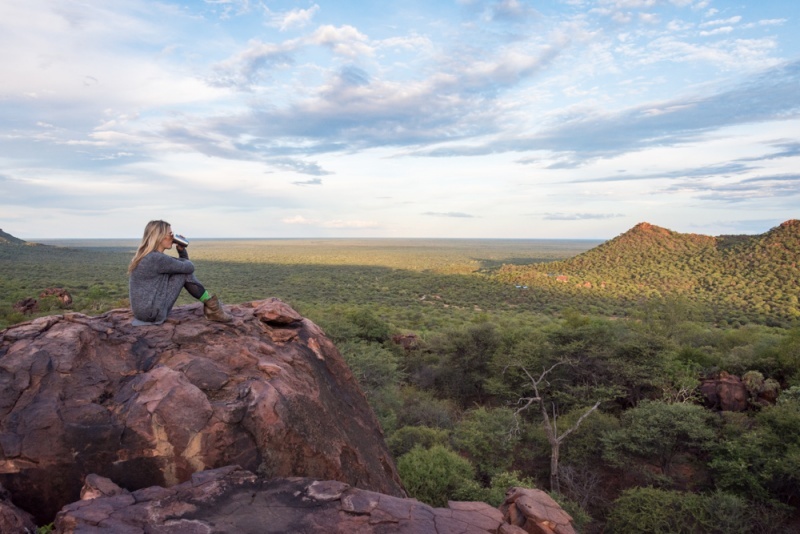 Your next stop along your Namibian road trip will be one of the most famous tourist destinations in the country! 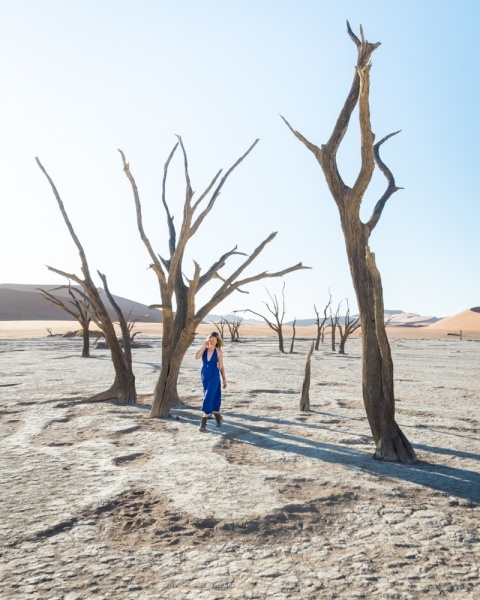 Located in the Sesriem/Sossusvlei area of the Namib-Naukluft National Park is quite an unusual natural wonder – a dry lake bed filled with trees in the middle of the sand dunes. It will take you about 2.5 hours to reach the campsite from the castle. From there you’ll drive about an hour through the park on a paved road until you reach the parking lot at the end of the road. 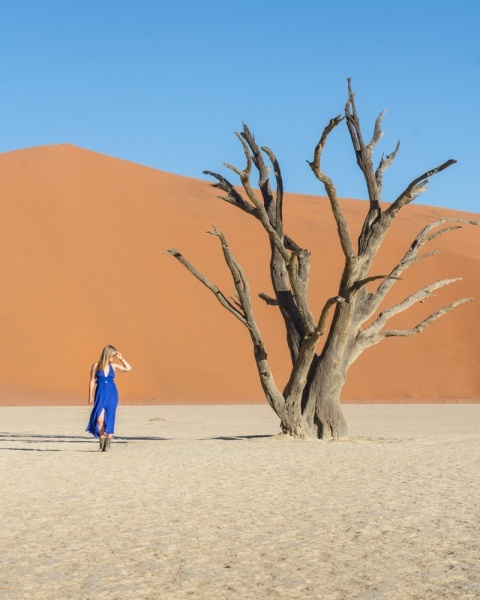 Then you’ll have a few choices; you can walk the 3.5 miles to Deadvlei, you can take the shuttle for 300 NAD/person, or you can attempt the 2-mile sandy drive if you have a 4×4 vehicle. Driving in the sand can be tricky. Before you begin you’ll want to deflate your tire pressure to 1.5 bars (but only if your rental company provided you with an air compressor). Make sure you keep moving while you’re in any deep sand as you’re most likely to get into trouble when you try to start again from being at a stop. If you do get stuck you’ll need to dig your truck out a bit before you try to start moving again (your rental car company should supply you with a shovel). Park Entrance Fee: 80 NAD/person + 10 NAD/car. Hours: Campers can enter the park from 6:00am – 8:30pm and non-campers can enter the outer gate from 7:00am – 8:00pm. Camping Amenities: You’ll pay an additional 50 NAD for 150 MGB of data, but the gas station across the road offers free internet. Each campsite has electricity, water, and recycling containers. Activities in the Area: Enter the park at 6:00am, as soon as the gate opens, and make the 45-minute drive to Dune 45. There is a parking lot and a sign to mark it. You’ll have a steep climb to the top of this 260-foot sand dune but the view of the surrounding area at sunrise is spectacular. 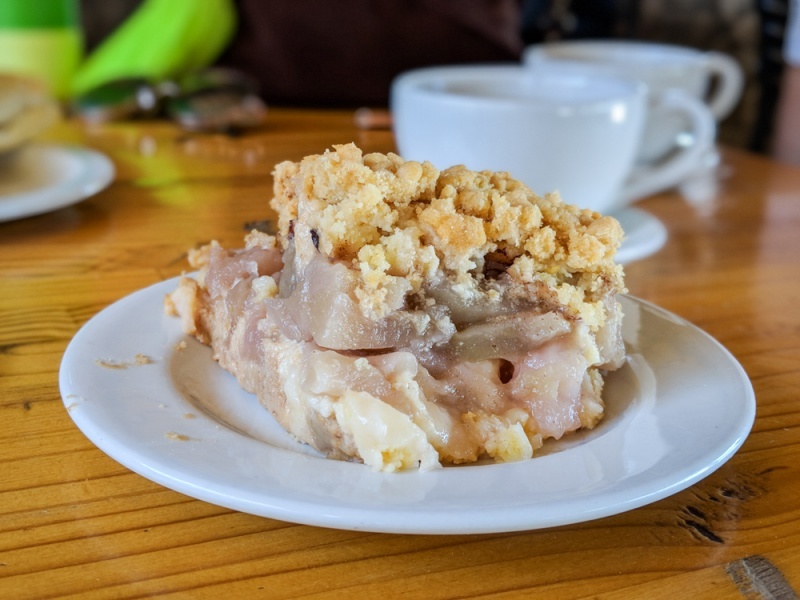 Solitaire is a tiny town in the middle of nowhere that just happens to be famous for their apple pie. Make a stop to try a slice and fill up on gas before heading to your campground to spend the afternoon at the pool. 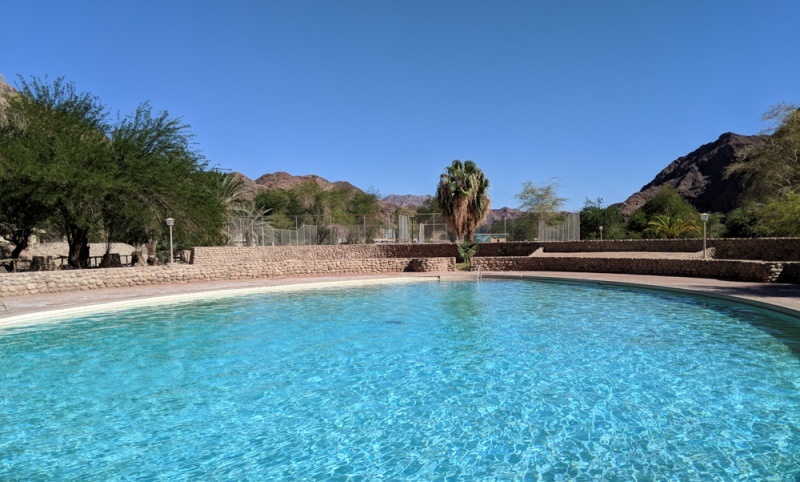 The drive is only about an hour from Sesriem so you’ll have plenty of time to enjoy the reasonably priced beers at the pristine pool at Solitaire Desert Farm Camp. But don’t go to bed too early as Solitude is an amazing place to do a little stargazing! Camping Amenities: There are only 3 campsites in this luxury farm camp but each site has it’s own bathroom, shower, and kitchen area. 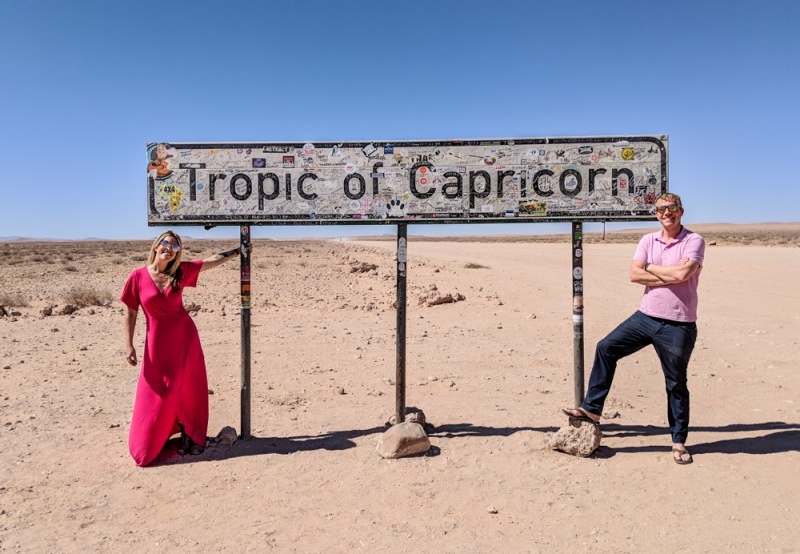 From Solitaire you’re headed northeast across the Namib Naukluft National Park and along the way you’ll cross the Tropic of Capricorn – the perfect iconic spot for a photo. 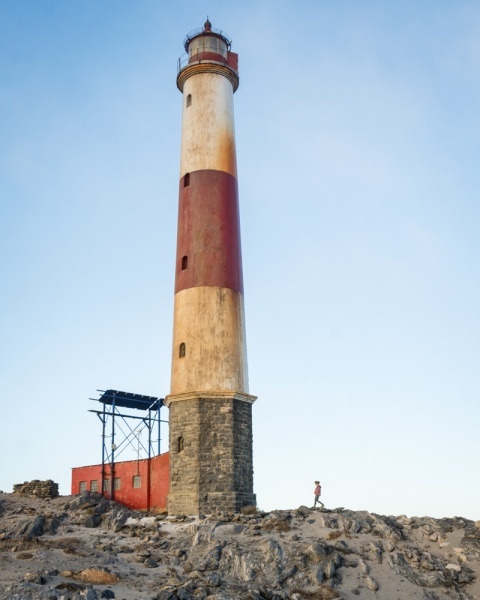 The town of Swakopmund offers a range of outdoor adventures for travelers to enjoy. From riding quads in the vast Namib Desert to sailing around the South Atlantic while munching on fresh oysters, this little town has something for everyone. Since you’ve been on the road for a little while, it’s time to pamper yourself with a real bed and a relaxing massage. So book a room at the Villa Margherita, drop off your laundry, schedule a massage, and enjoy being out of your car for a few days. 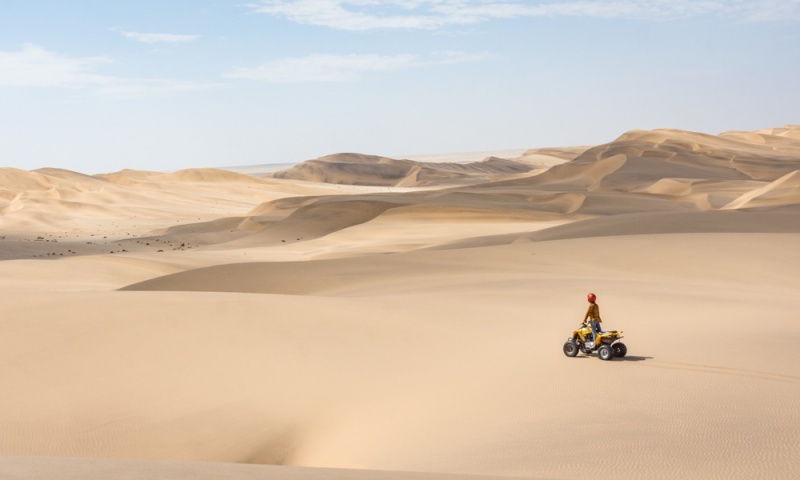 While you’re in Swakopmund make sure you take a quad tour through the massive dunes along the coast! Read more about everything there is to see and do in Swakopmund here. Hotel Amenities: Beautifully decorated suites, spa services, a delectable restaurant, a peaceful garden area for reading and relaxing. Parking: Secure parking area for your rental car. The stretch of coastline known as the “Skeleton Coast” has been called both “the land God made in anger” and “the gates of hell”. Sadly many ships have wrecked along this desolate coastline over the years and to this day it is still scattered with the remains of both animal skeletons and ships. And because this area of Namibia is so forbidding, it is also one of the most pristine coastlines in the world. The Skeleton Coast National Park has strict hours for entry and exit so you’ll need to make sure you reach the Ugab Entry Gate (about a 3 hour drive north of Swakopmund) before 3:00pm. And exit through the Springbokwasser gate before 7:00pm. It’s advisable to get an early start to ensure you’re leaving Swakopmund by 9:00am. This will give you ample time for slow driving along the incredibly bumpy road and for a few stops along your drive. 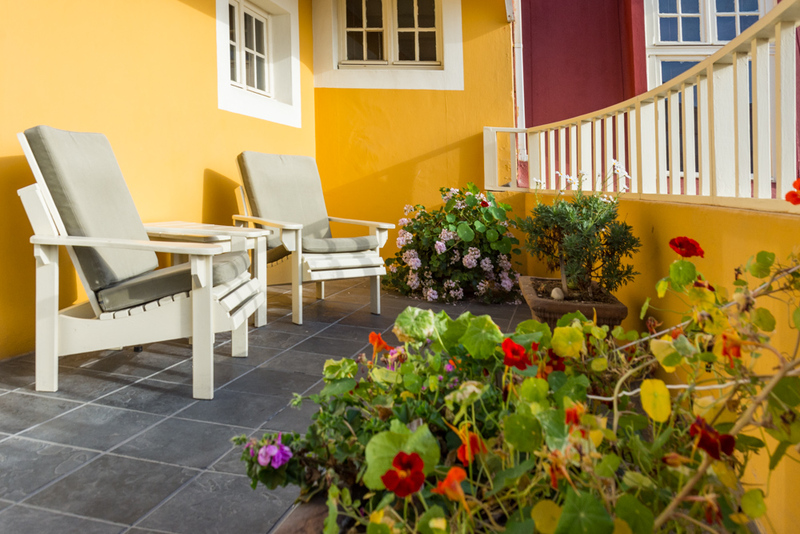 You’ll also want to make sure you fill up on gas, water and groceries before leaving Swakopmund as you’ll encounter little in the way of amenities for several hundred kilometers. There are a few notable stops along the C34 highway that you can’t miss! Thousands of stinky, noisy fur seals call the Cape Cross Seal Reserve home and it is amazing to walk along the fenced walkway and see them up close and personal. And the Huab Lagoon is a beautiful pink salt lagoon sitting just inland from the ocean. 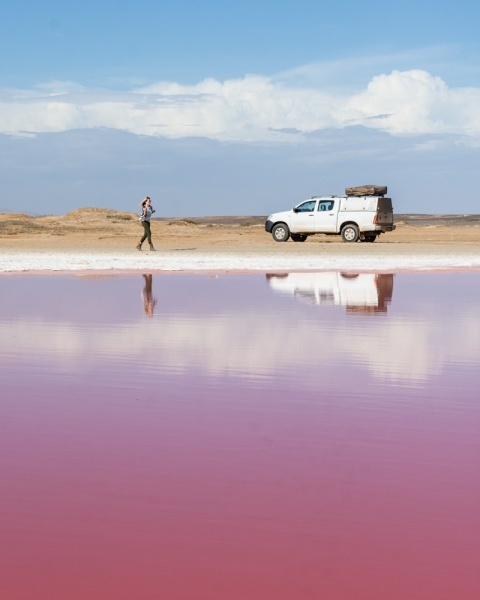 If you’ve never seen a pink lake before, you’ll be in awe of this phenomenon. Park Entrance Hours: The gate to enter the Skeleton Coast Park is only open from 7:30am until 3:00pm and you must exit the other side between the hours of 7:30am and 7:00pm. The campsite is right outside of the gate you’ll be exiting. 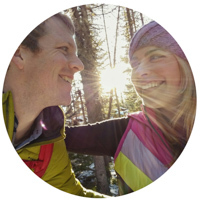 Camping Amenities: There are only 4 campsites here and they are pretty bare bones. Skip showering for the night, these bathrooms are dismal. Road Conditions: The C34 highway is incredibly rough and it is not recommended that you drive it unless you have a 4×4 vehicle and a spare tire or two. The Himba Tribes in Namibia have managed to preserve their heritage and culture despite influence from Western colonization and tourism. Living in huts made of cow dung and ash, dressed in furs and beads, and painting their hair and bodies in herbs mixed with lard, these tribes can teach foreigners quite a bit about living in this desolate desert. The town of Opuwo is where you’ll want to stock up on food and gas before heading north to the border with Angola. This town is pretty nuts – the gas station has a consistently long line and you’ll likely be bombarded by Himba people asking you for money and/or trying to sell you trinkets. But it’s interesting to see tribal people and those that have been influenced by western culture living side-by-side. 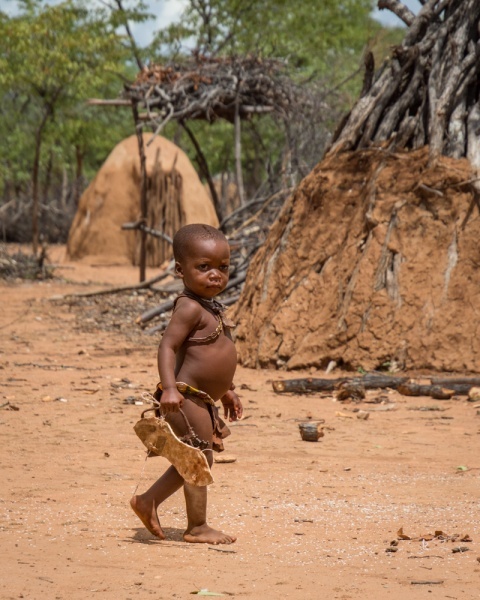 The Ovahimba Living Museum is about 26 miles north of Opuwo. It’s preferable to visiting others as you’ll pay an upfront fee and won’t be asked for tips to take photographs or feel pressured to buy anything during your visit. Choose the 2-3 hour “daily life” tour for 250 NAD/person to learn about how they make their homes, their clothes, and see some traditional dancing. Ask your tour guide lots of questions and bring some snacks for the children. Camping Amenities: There are 12 large campsites with electricity, water, and a barbecue area. 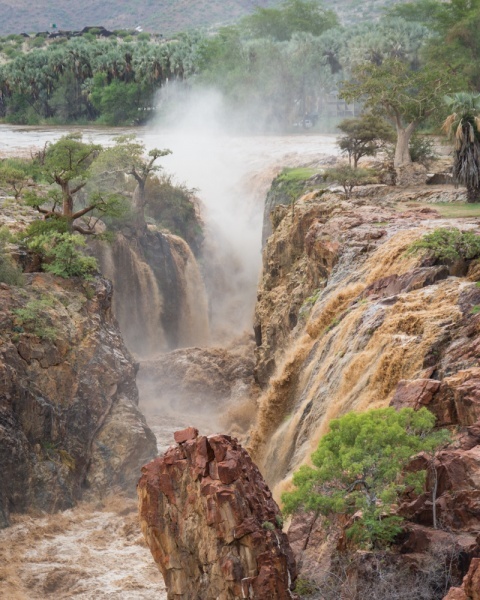 Epupa Falls is a massive waterfall that sits right on the border of Angola. It’s about 112 miles from Opuwo and the road is slow going with several small river crossings if it’s been raining. Expect the drive to take about 4 hours. And expect nearly every person you pass to try to get you to slow down to give them food, water, or money. You’ll be camped at the top of the falls where you can watch the incredible force of the water swirling around. Have a “sundowner” at the bar while watching the spectacular sunset over the falls. Camping Amenities: There are nice bathrooms (but with no toilet paper) with showers. Each camp has a faucet and a fire pit. However all of the tap water is river water and cannot be consumed. You can buy water at the bar for a steep price. Hiking: There are several guides around the campsite offering day hikes for a fee. There is also a nice trail running from the falls viewpoint that you can do on your own. 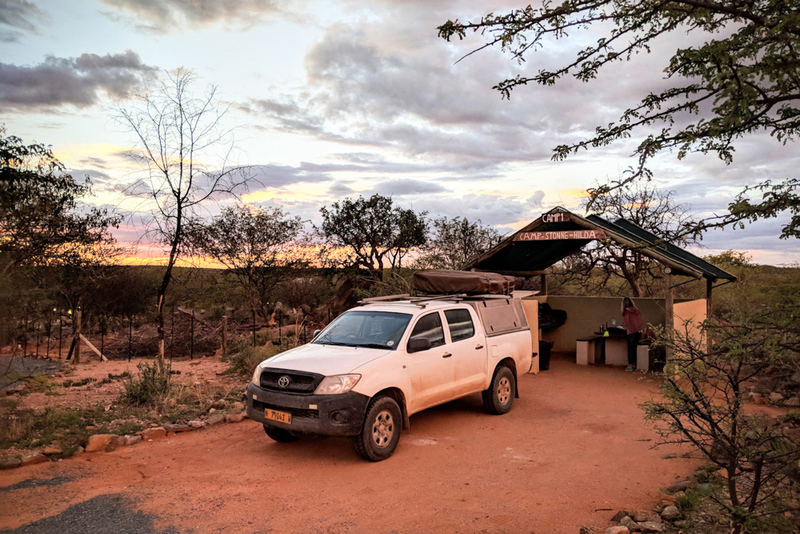 Your next major stop along your road trip will be Etosha National Park but the drive from Epupa Falls is so long that it’s not realistic to get it all done in one day. 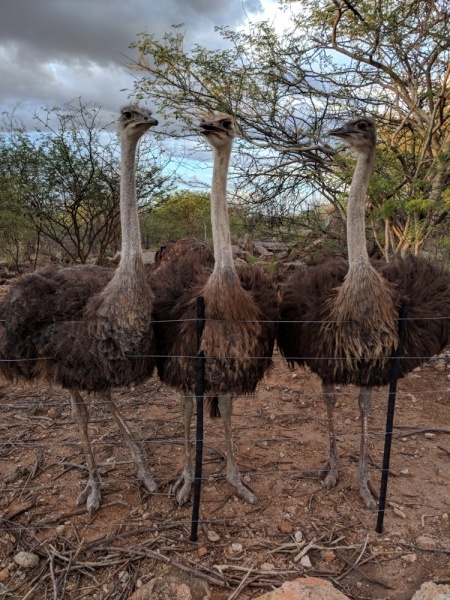 So make a pit stop along the way to stay at a camp that offers a pool, a bar, curious ostriches, and porcupine feedings in the evenings! If you have time, take the day to lounge by the pool to give yourself a break from all the driving! Camping Amenities: Campsites offer a large covered seating area with a table, sink, electricity, and garbage service. 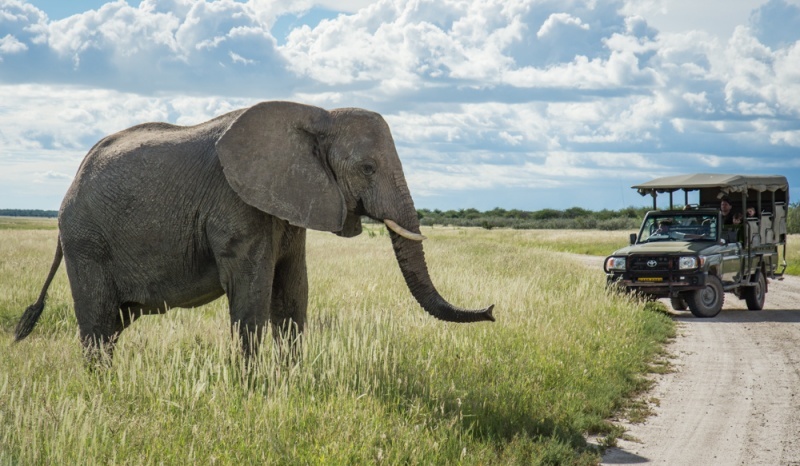 Plan on spending several days checking out Etosha National Park. Read all about camping, driving, and wildlife spotting in the park here! Much of your Namibian itinerary so far has been spent in the car as so much of the country is so easily accessible. The Waterberg Plateau Park offers the opportunity to do some guided or self-guided walks through this beautiful area. The prominent table mountain rises up from the plateau and the entire surrounding area was declared a nature reserve in 1972. Due to the fact that the plateau is mostly inaccessible, many of the endangered species of Namibia were relocated there to protect them from poachers. If you choose one of the guided tours you may be able to spot both black and white rhinos. 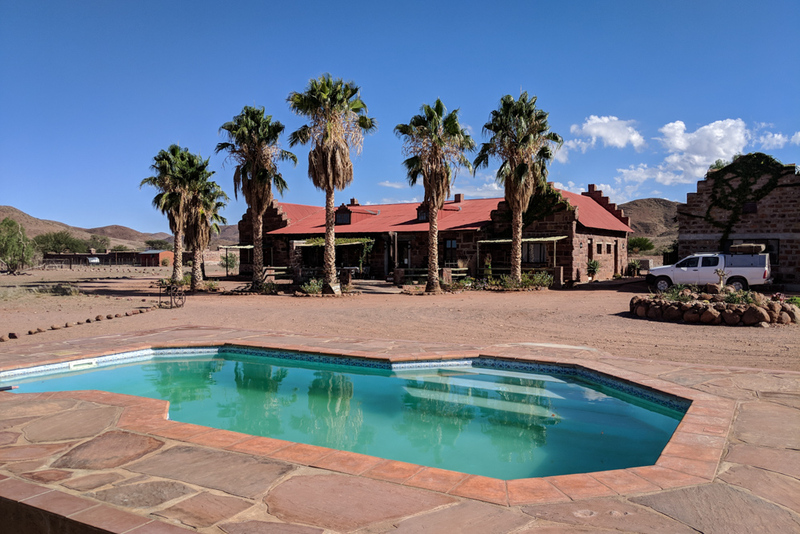 Even getting out and doing a self-guided walk will give you the opportunity to enjoy the flora and fauna of the area as well as potentially view birds, antelope, and other animals that populate this protected area. Camping Amenities: A private bathroom for each campsite, pool, no electricity. Hiking: There are several self-guided hikes around the area or you can opt for guided hikes or drives for a chance to spot some rhinos. 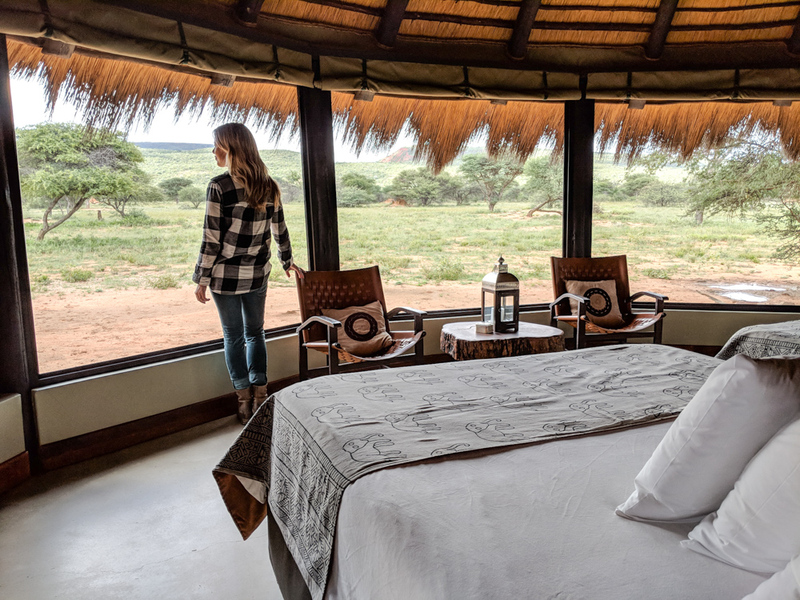 No trip to Namibia is complete without a stay in a luxurious tent camp where you can lounge in bed while wild animals graze outside of your window. And there is no better place in the country to get your fill of luxury and safari excursions than at the Okonjima Nature Reserve. Not only will you be treated like royalty in this gorgeous camp, you’ll also dine on amazing cuisine and get the opportunity to view a diverse range of wildlife. You’ll also learn about the amazing work that the AfriCat Foundation is doing to protect the cheetahs in the country. Hotel Amenities: Spacious rooms with large windows for wildlife viewing. Large, private open-air lounge area next to your room. Delectable breakfast and dinner included in your stay. 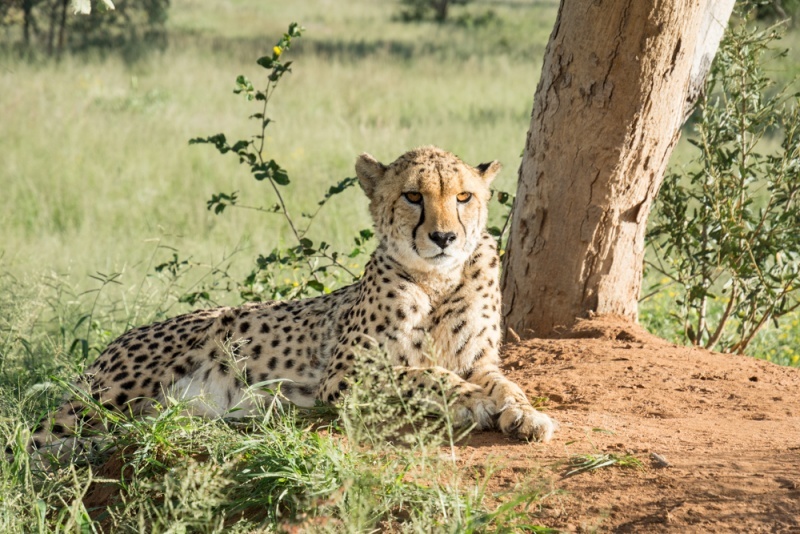 Activities in the Area: Okonjima offers a range of guided tours to get you out into the bush to look for cheetahs and leopards. It’s an amazing opportunity to get close to these beautiful animals from the safety of your vehicle. And finally, it’s time to drive the remaining 2.5 hours back to Windhoek to return your rental vehicle and head to the airport. 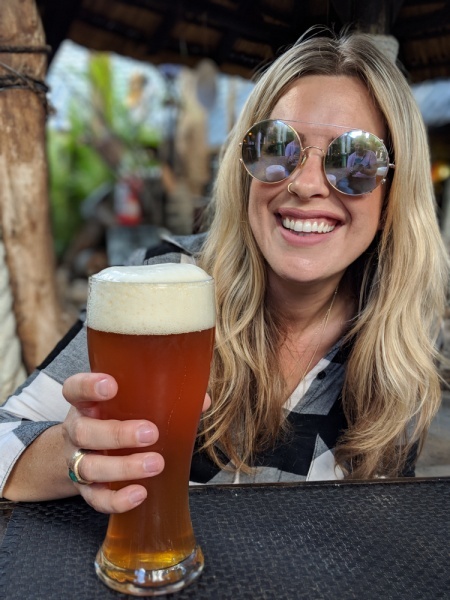 If you have extra time, be sure to stop by the most famous restaurant in all of Namibia, Joe’s Beer House for an ice cold beer! 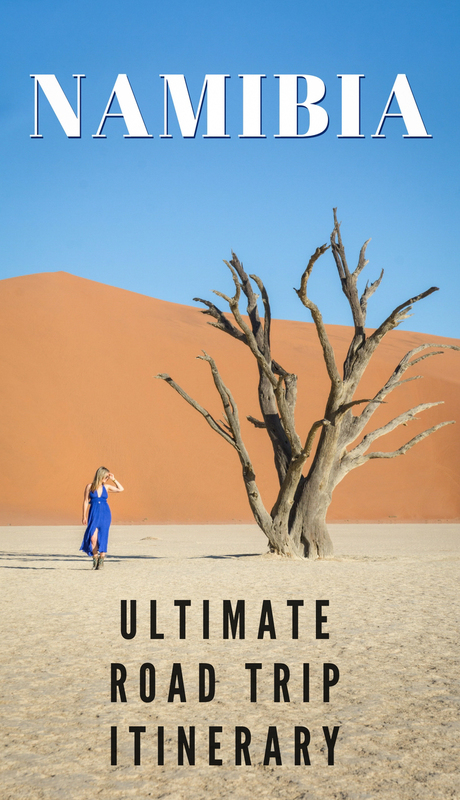 Hopefully this itinerary has provided you with all the tools to plan your once-in-a-lifetime trip to Namibia!